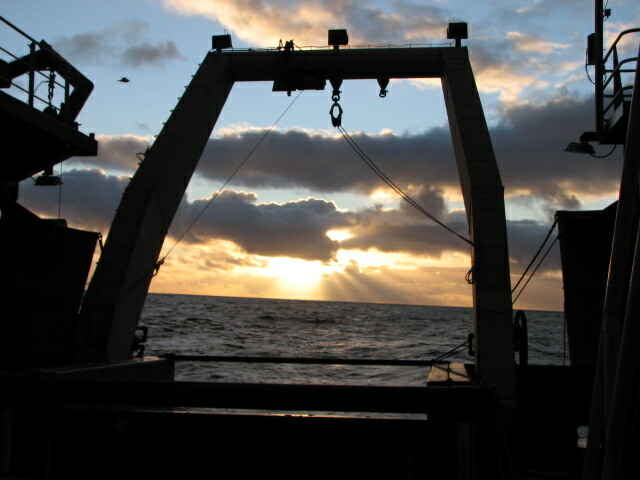 We are on Day II of our travels to get to our first sampling station located in the SE Bering Sea. We will begin our fishing operations today! 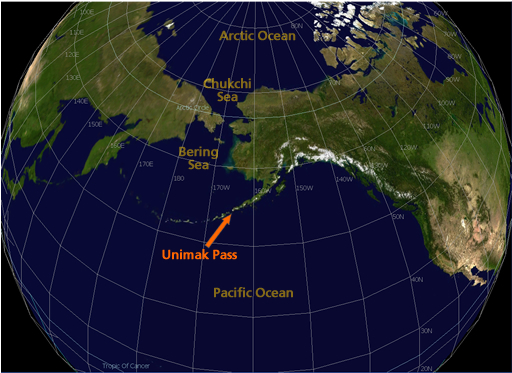 We have had decent weather thus far although we did just go through Unimak Pass (see picture below of location) which is a narrow strait between the Bering Sea and the North Pacific Ocean. This passage offered a time of heavier seas. I’m guessing that like any strait, the currents may become more funneled and the seas “confused” as they squeeze through this area. It’s kind of analogous to it being more windy in between buildings of a major city vs. suburbia as the wind is funneled between skyscrapers. I also imagine this to be a popular crossing for marine mammals as well. Interesting to think that both marine mammals and humans use this passage to both get to the same things: a food source and a travel route. It’s a migratory “highway” for marine mammals, and a heavily-trafficked area for humans in international trade and commercial fisheries. Anyway, the Bering Sea is a very unique body of water. It really is the way that I imagined it. It is as though you are looking through a kaleidoscope and the only offerings are 1000 different shades of grey. It is rainy, foggy, and windy. I can appreciate how this sea has been the graveyard for so many souls and fishing vessels in the past who have tried to extract the bounties it has to offer. As of Wednesday, the 24th, we have finished 4 stations of the 30 that have been planned for Leg I of this study (Leg II is of similar duration and goals). I was involved with helping the oceanographic crew with their tasks of collecting and evaluating various parameters of water chemistry. 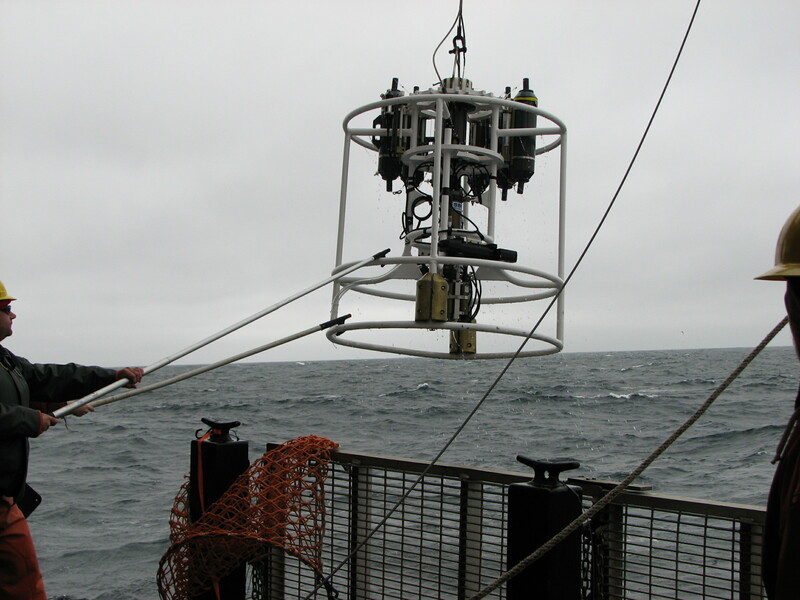 To do this, an instrument called a “CTD”– an acronym for Conductivity, Temperature, and Depth — is lowered. This instrument is the primary tool for determining these essential physical properties of sea water. It allows the scientists to record detailed charting of these various parameters throughout the water column and helps us to understand how the ocean affects life and vice-versa. One aspect that I found very interesting is the analyzing of chlorophyll through the water column. All plant life on Earth contains the photosynthetic pigment called chlorophyll. Phytoplankton (planktonic plants) occupy the photic zone of all water bodies. Knowing that we live on a blue planet dominated by 70% coverage in water, we can thank these phytoplankton for their byproduct in photosynthesis, which is oxygen. Kind of strange how you often symbolize the environmental movement with cutting down of the rainforests and cries that we are eliminating the trees that give us the air we breath. This is true, but proportionately speaking, with an ocean-dominated sphere, we can thank these phytoplankton and photosynthetic bacteria for a large percentage of our oxygen. Additionally, being at the base of the food chain and primary consumers, these extraordinary plants have carved a name for themselves in any marine investigation/study. 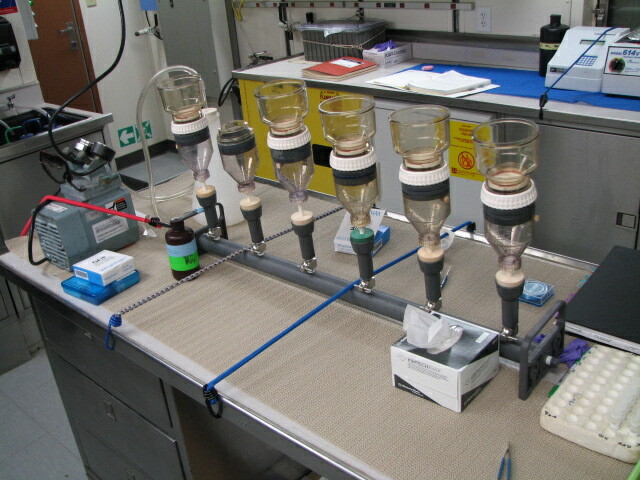 The procedure to measure chlorophyll involves the following: water from the Niskin Bottles (attached to the CTD, used to “capture” water at select depths) is filtered through different filter meshes and the samples are deep-frozen at -80F. To analyze chlorophyll content, the frozen sample filter is immersed in a 90% solution of DI (Distilled Water) and acetone which liberates the chlorophyll from the phytoplankton. This is then sent through a fluorometer. Fluorescence is the phenomena of some compounds to absorb specific wavelengths of light and then, emit longer wavelengths of light. 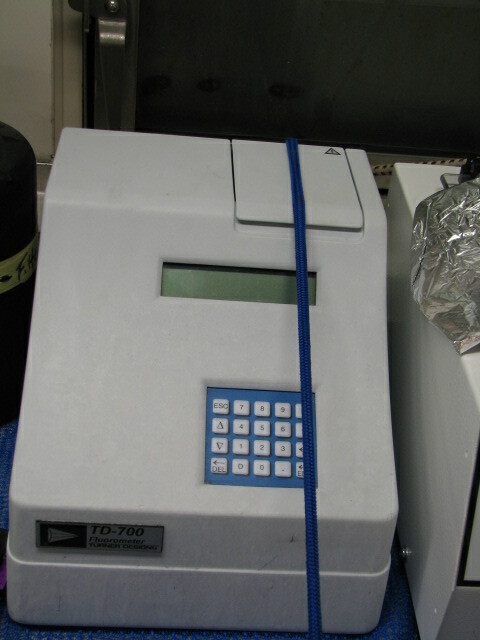 Chlorophyll absorbs blue light and emits, or fluoresces, red light and can be detected by this fluorometer. Amazing to think that with this microscopic plant life, you can extrapolate out and potentially draw some general conclusions about the overall health of a place as large as the Bering Sea. Oceanographic work is remarkable. The crew aboard the Oscar Dyson have been very accommodating and more than willing to educate me and take the time to physically show me how these scientific investigations work. I am very impressed with the level of professionalism. As a teacher, I know that most often, the best way to teach students is to present the material in a hands-on fashion…inquiry/discovery based. This is clearly the format that I have been involved in while in the Bering Sea and I am learning a tremendous amount of information. The food has been excellent (much better than I am used to while out at sea). The seas have been a bit on the rough side but seem to be settling down somewhat (although, I do see a few Low Pressure Systems lined up, ready to enter the Bering Sea…..tis the season). Veteran seamen in this area and even in the Mid-Atlantic off of NJ, know that this is the time of year when the weather starts to change). On a side note, I see that Hurricane Irene has its eyes set on the Eastern Seaboard. I am hoping that everyone will take caution in my home state of NJ. Lastly, it’s amazing also to think of the depth and extent of NOAA. With oceans covering 70% of our planet and the entire planet encompassed by a small envelope of atmosphere that we breathe, it is fair to say that the National Oceanic and Atmospheric Administration is a part of our everyday lives. I am in the Bering Sea, one of the most remote and harsh places this planet has to offer and across the country, there are “Hurricane Hunters” flying into the eye of a hurricane that could potentially impact millions of people along the Mid Atlantic………..Both operated and run by NOAA! This entry was posted in 2011, Kevin Sullivan, NOAA, NOAA Fisheries Service, NOAA Research, NOAA Teacher at Sea and tagged Berring Sea, CTD, fisheries, fluorometer, food chain, Hurricane Hunters, photosynthesis, phytoplankton, Primary Productivity. Bookmark the permalink.